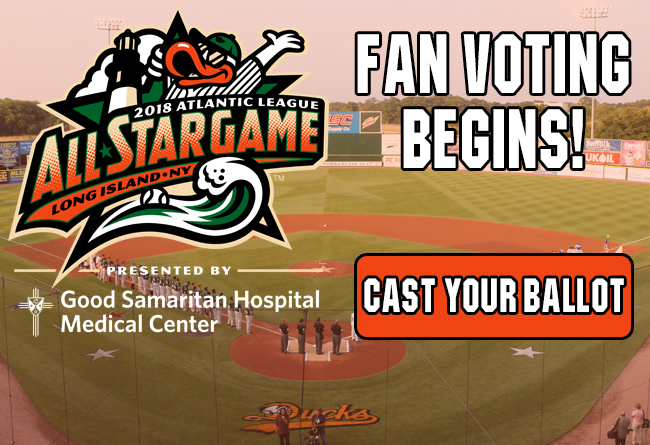 (Central Islip, N.Y., May 30, 2018) – The Atlantic League of Professional Baseball Clubs today announced that voting is officially underway for the 2018 Atlantic League All-Star Game, presented by Good Samaritan Hospital Medical Center. Fans can cast their ballots online from Wednesday, May 30th, to Friday, June 29th, by CLICKING HERE. Those wishing to vote may do so as often as they like to help get their favorite players on the rosters that will represent the Liberty and Freedom Divisions at the All-Star Game on Wednesday, July 11th. Fan voting will be used as a percentage towards All-Star selection along with voting from AtlanticLeague officials and media. The Atlantic League’s 21st Annual All-Star Game will be held at Bethpage Ballpark, the home of the Long Island Ducks, on Wednesday, July 11th, at 6:35 p.m. The midsummer classic will be preceded by the Digmi Home Run Derby, showcasing several of the top power hitters in the league this year. Following the game, all fans in attendance will be treated to the biggest Fireworks Spectacular of the season. Tickets for the 2018 Atlantic League All-Star Game, presented by Good Samaritan Hospital Medical Center, are on sale now! Fans can purchase their tickets by visiting the Bethpage Ballpark box office, calling (631) 940-TIXX, CLICKING HERE or downloading the Ducks mobile app. More information regarding the All-Star Game and its surrounding events will be announced as the game date approaches.